Here are 5 online WEBP to GIF converter websites. All the sites are available for free. You can simply drag and drop the input file in the converter. Then, you can target the output format as GIF. And then, you can go to convert the files. Also, you can download the output of the converted GIF file. The online converters do not require any signups rather provide you output with no watermark. Also, you can add WEBP file from Google Drive, Dropbox or by URL. Most of the converters let you customize the result of the GIF file. For example, you can set preferences like size, color, loops, etc. You can also make transparent GIFs using websites. Let’s go through each online WEBP to GIF converter. EZGIF is an online WEBP to GIF converter free website. You can simply browse the WebP file from your computer. Then, you can click on the Upload button. After that, the site lets you customize the output of the animated GIF. You can set the delay time, loop count, effects like crossfade frames, remove the frames, etc. Besides that, you can set the toggle range of frames. Once you’re done with the customization, you can click on the Make a GIF button. Once you click on the button, the output of the GIF file appears below. The best thing about this site is that it lets you modify the output before downloading it. You can crop, rotate, optimize, speed, split, etc. Thereafter, you can save the file on your computer. Zamzar is another good option to convert WEBP to GIF files online. You can follow three simple ways to convert files. The first thing you need to do is upload the WebP file in the converter. You can add multiple files as well. Then, the second step is to choose the output format as GIF. Thereafter, you can click on the convert button. 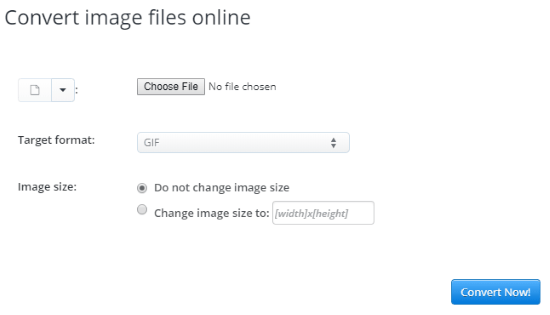 Once the file gets converted, you can download the output of GIF file on your computer. If the file takes time while conversion, you can enter your email id. Doing so, you don’t need to wait as you will be notified via email. Convertio is a good website to convert files. This online file converter lets you add more than one file in the converter. Also, the converter lets you upload a file in the converter from your computer, Google Drive, Dropbox, or URL. The maximum file size is 100 MB. 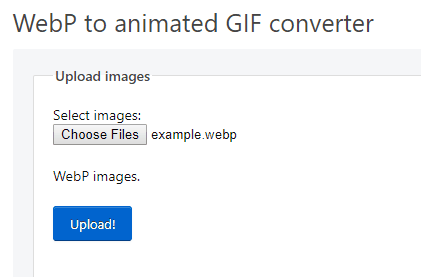 When you add WEBP file in the converter, you can select the output format as GIF. Thereafter, you can click on the convert button. Once the file conversion is done, you can download the output of the converted GIF file. Aconvert.com is another online file converter. You can easily convert WEPB to GIF file with this converter. To do so, you need to upload WEBP file in the converter. Also, you can upload the input file from your computer, Google Drive, Google Drive, Dropbox. Thereafter, you can set the target format like GIF. The converter lets you set the image size like width and height. After that, start converting the files online. When the converter converts the WEBP file, it shows the result of GIF file below. You can click on that to download the output of GIF file. 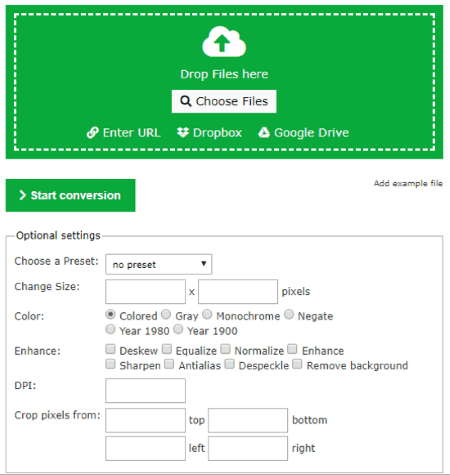 The converter lets you save the file directly on Google Drive, Dropbox. It generates QR code as well. Also, you can compress the file and download as zip file. Online-Convert.Com is a good WEBP to GIF online converter. To convert the files with this converter, you have to choose the output format in which you want to convert the files. You can go to convert to GIF option. Then, you can browse the input file from your computer. Also, you can add files from Google Drive, Dropbox, or by URL. The converter lets you customize the output of GIF file. You can change the preset, size, color, etc. Thereafter, you can convert the file and download the output of GIF file. When it comes to online, your work gets done quickly. Similarly, using these online file converters, you can convert files from one format to another. Also, the converter lets you customize the output of the converted file.